As noted in the Ithaca Times, the eco-conscious folks who developed the Aurora Street Pocket Neighbrohood have a new proposal in the works. 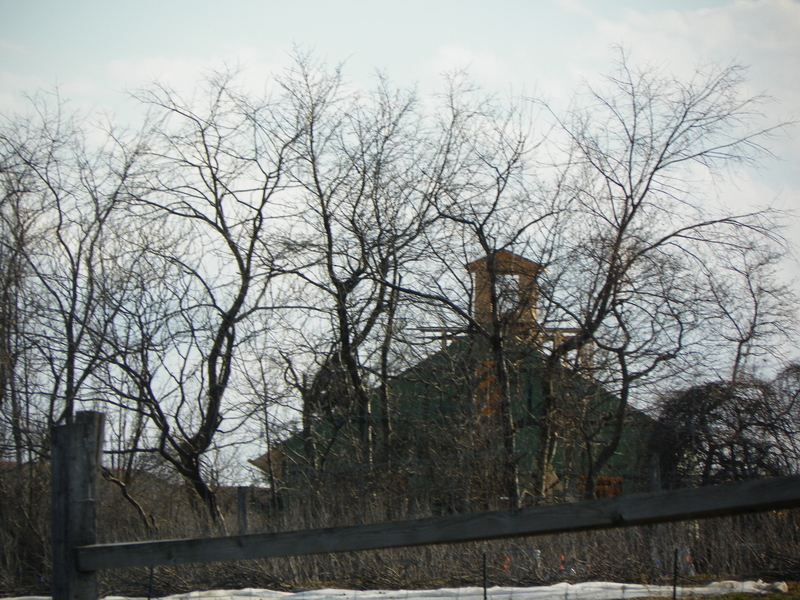 The location for this one, however, isn’t as urban – the site is located off of Five Mile Drive, just west of Elmira Road and the southwest area’s suburban big-box land (fun fact – the road starts at an intersection with Elmira Road five miles from the shores of Cayuga Lake, hence the name). This general area has seen a sizable number of single-family homes built in the past decade, though nothing multi-unit like the proposal. 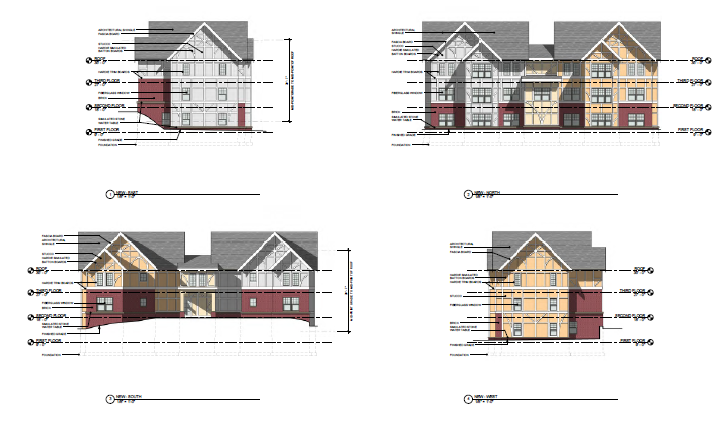 Speaking of which, the basic stats – ~36 units, “craftsman” style homes 1-2 floors, single or 3-unit properties depending on preference, and a common house/community center. Enough of seems to be up in the air style-wise that New Earth Living is asking interested parties to fill out surveys or email them, so they can flesh out their proposal. Style-wise, we already have a good idea what this might look like by looking at the Aurora Street Pocket Neighborhood, which consists of one renovated home and 4 units in three newly-built properties tucked in from the corner Aurora and Marshall. Green construction, solar panels, LED lighting, food grown on property, but no true farm on the property, and units are clustered but still separate – in some ways, this project seems like a toned-down version of Ecovillage. 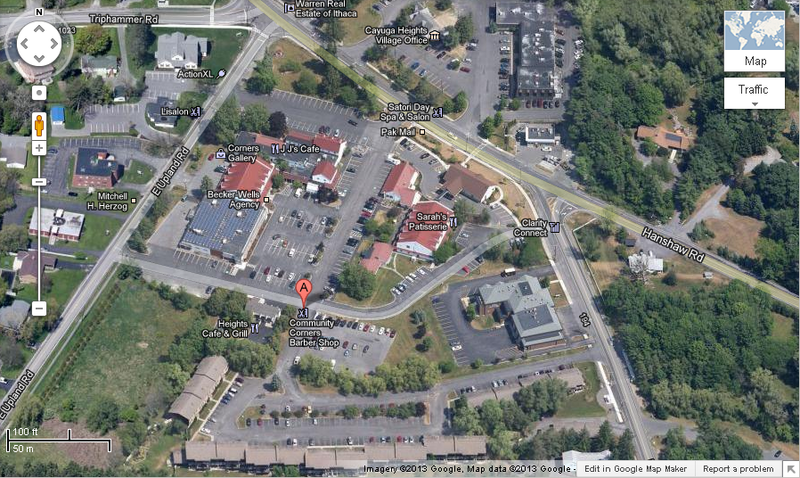 Ithaca has a lot of folks that lean far left, and a lot of development going on as of late. This seems like a pretty natural outcome of those two forces. Hopefully, this will be a project the community can get excited about as it moves forward. So the folks in Cayuga Heights are getting in on the development game. In this case, local developers are interesting in taking one of the few mixed-use areas of the wealthy bedroom community, and densifying it. The focus of this proposal is the Community Corners area, the small, mostly commercial parcel next to the awkward intersections of Triphammer, Hanshaw and East Upland Roads. 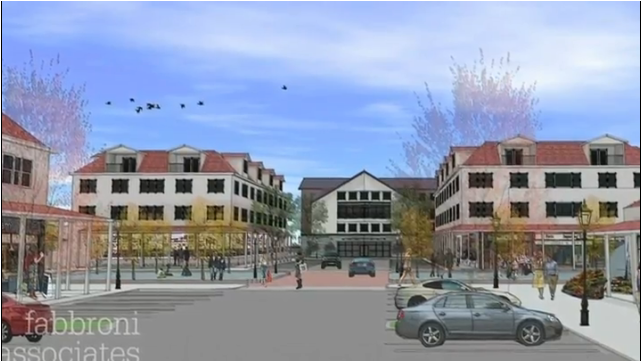 According to the Ithaca Journal, Most of the new construction would be focused on the grassy parcel at lower left, while some of the buildings already exist would be expanded upon with additional floors, such as the Island Fitness in the lower left of the commercial patch. 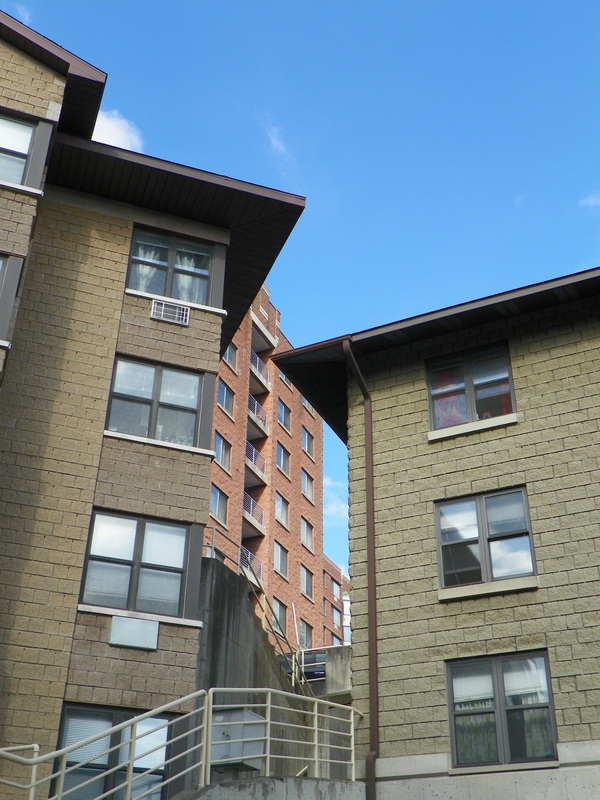 The two parcels, although owned by separate groups (The Ciaschi Family, the same ones for whom the corner of College and Dryden is named, own Community Corners; the grassy parcel by Mark Mecenas). 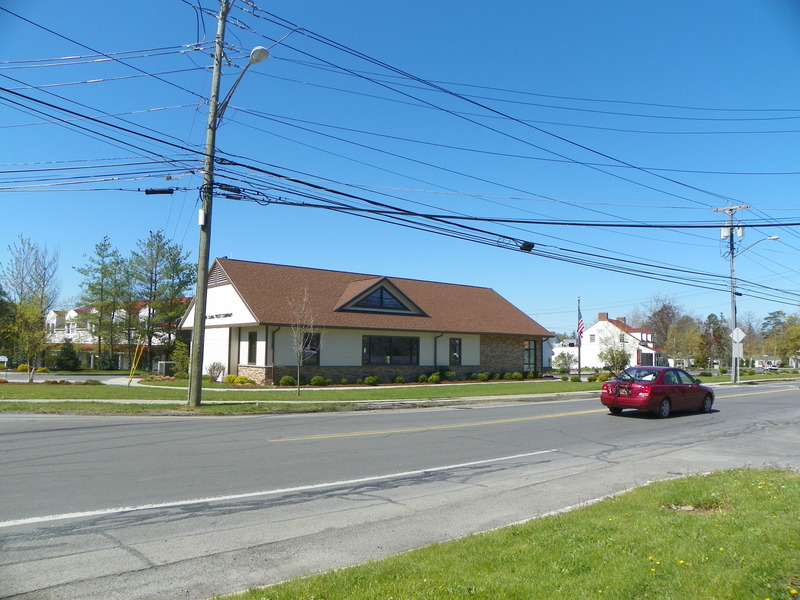 Notably, this building only finished renovation last year; the bank in the lead image and the two-story office building at Triphammer and Upland are only about three years old. Incorporated into the proposal – more lower-level retail and office space, and about 100 units of housing, up to four floors in height. 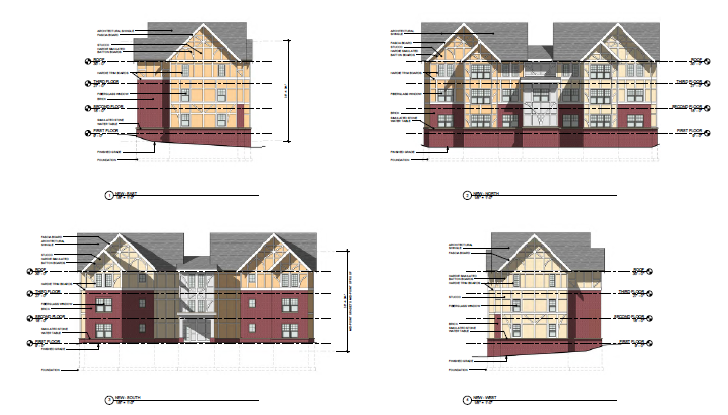 this would require a zoning variance, as the maximum height for Cayuga Heights is about 30 feet. The design thrown out there is from (Larry) Fabbroni Associates, who tend to be called on much more to discuss the civil engineering aspects of development projects rather than actual designs. I prefer to think of the above designs as more of a scheme than anything concrete. Oh look, they even threw the vaguely hipster-like musician in there! How quaint! Mecenas notes in the IJ article that build-out for this project would likely take a few years, and that’s after the village approves the zoning changes. 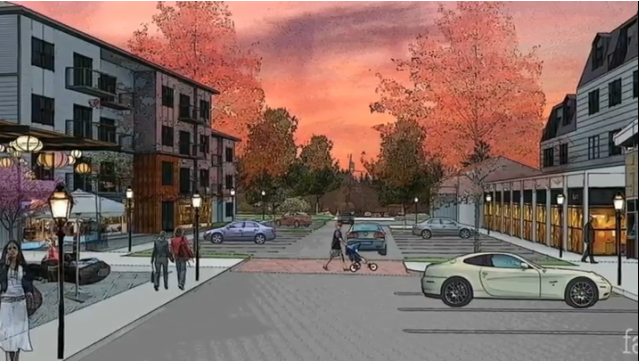 But, a pedestrian-friendly mid-rise core to Cayuga Heights would definitely make it feel more like its own community rather than a wealthy branch of the Ithaca tree. So, I know I’m playing “catch-up” here, but the guys at Ithaca Builds have shown me a potential source for renderings – the specialized google search of city documents. Lo and behold, elevations for the Purity Project. From John Snyder Architects, it’s boxy and glassy and rather restrained as modern designs go. The design would have a 5-story structure that tops out at 64 feet – more than enough to make it a visual focal point for the surrounding neighborhood. 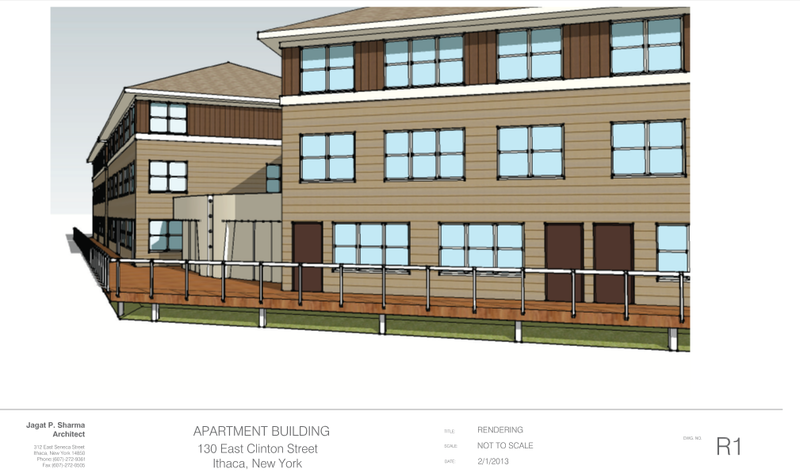 The rendering from Ithaca Builds suggest the building will use brickwork for some of the lines of the facade. 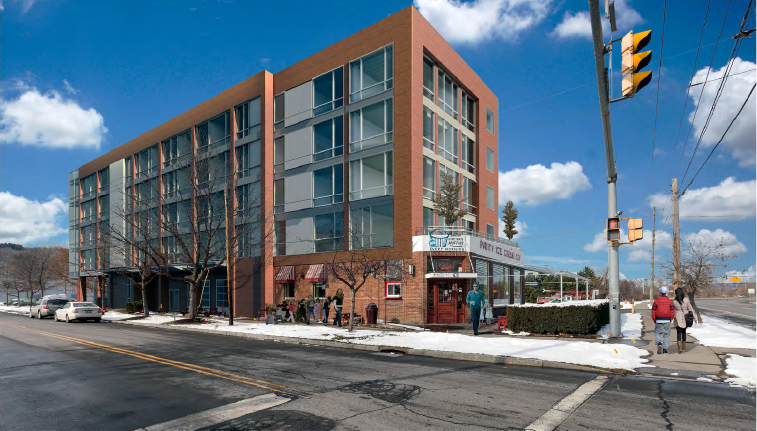 Also, personal opinion, the curved-wall two-bedroom units facing the inlet and West Hill would arguably be some of the coolest apartments in Ithaca. Construction is anticipated for commencement in September, going through to summer 2014. The latest design proposed by HOLT Architects shows four buildings with three styles – Building 1 (northernmost) and Buildings 2 and 3 (against Highland to its east) are fairly similar, though 2 and 3 are set into the hillside a little, and the design reflects that. Building 4 has massing more like a large house than an apartment building. Oddly enough, the PDF lacks elevations for Building 4. 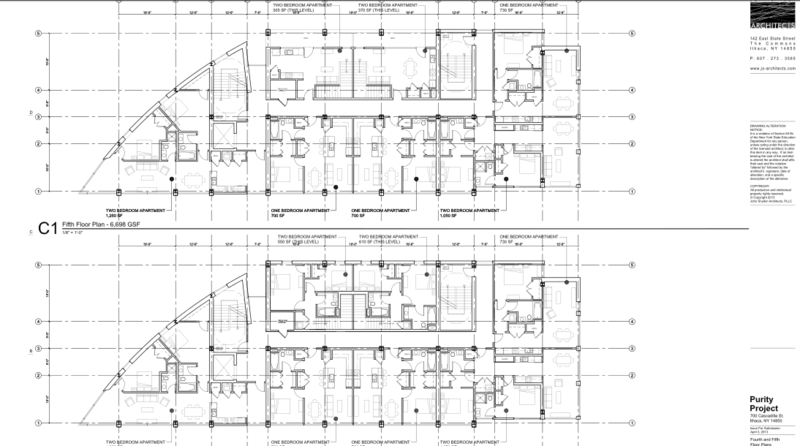 Assuming the floorplans in the PDF are similar on each floor in each building, this would produce 20 units, with 56 bedrooms (54 3-bedroom, 2 1-bedroom). Parking spaces were reduced from the originally proposed 40 to 27. Does it fit within the context of the neighborhood? The designs demonstrate hipped roofs, porches, architectural elements similar to the surroundings, and material samples and colors shown seem appropriate…so, check. Also, for what incredibly little it’s worth, I think it’s a very good design for the parcel, so much I wish they would tear down the ca. 1966 Rabco complex next door (although, I do wonder if the Tudor-esque “exposed beams” are a bit overboard). But, the real test will come when these begin construction, which with approvals in hand, should start around November, with a summer 2014 completion. Although I take a lot of jabs at “hippies”, the reason I never made it to Ecovillage before now had less to do with any personal stance and more to do with the fact it was just out of my way. 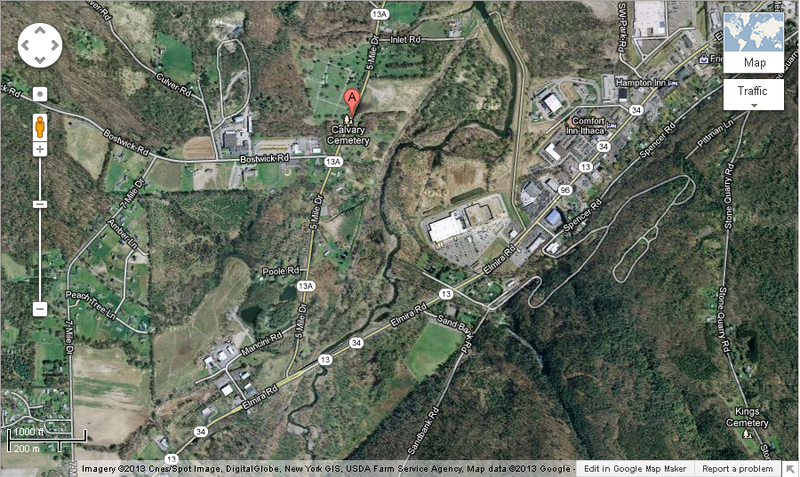 Rachel Carson Way lies about a mile and a half westward of Inlet Island, nestled in the hills opposite from Cornell. This means that when I past through, it’s farthest out of my way, so time often being a priority, it always sat on the bucket list. Finally, I made the conscious effort to take a trip up on my last photo tour. Ecovillage runs on the concept of co-housing, which in many ways runs close to most people’s idea of a commune (and mentally, I still find myself referring to it as a commune). There are optional shared dinners, a community-based work system, and of course, being in tune with the natural environment. Hence, solar arrays, housing designed to minimize energy use, foods grown on the property, and so forth. 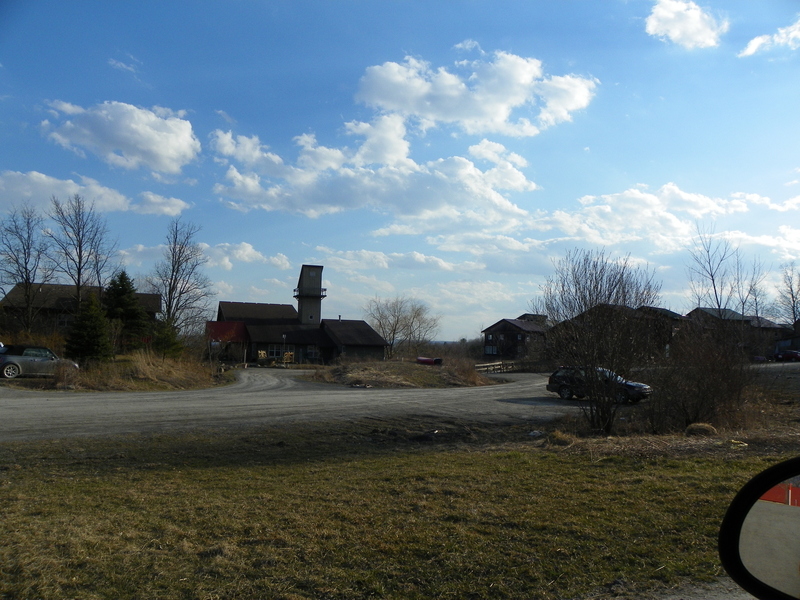 Ecovillage isn’t unique, not even in Tompkins County (White Hawk in Danby is a smaller but similar concept). But it is probably one of the best known developments of its kind. Ecovillage began planning in 1992-1993, when stakeholders purchased a former farm with the intent of launching an eco-friendly community. 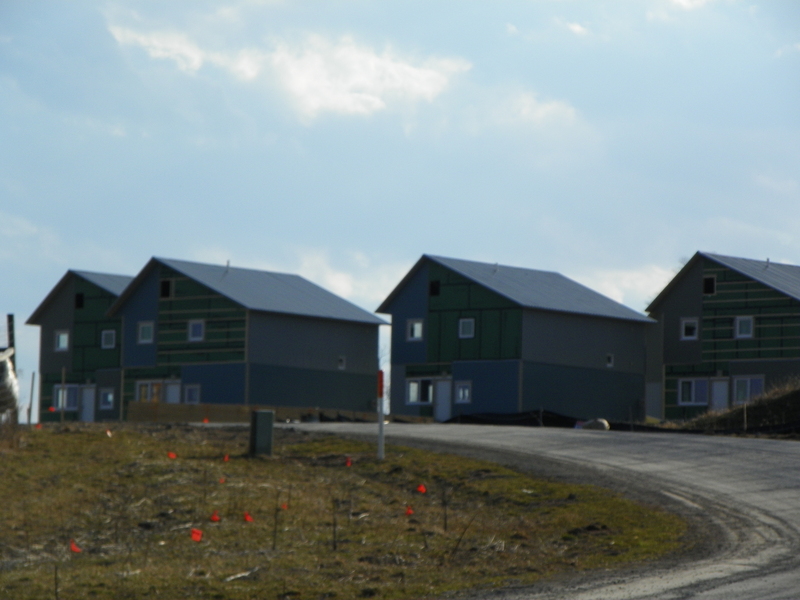 The first neighborhood, FROG (First Resident Group), began construction in 1995 and was completed two years later. The second community, SONG (Second Neighborhood Group), received site plan approval in 2001, and was built in three phases over five years. Each of these neighborhoods has 30 units with a community center. The community also has a few other bells and whistles, like a passive bus shelter, a root cellar, carports and a berry farm. 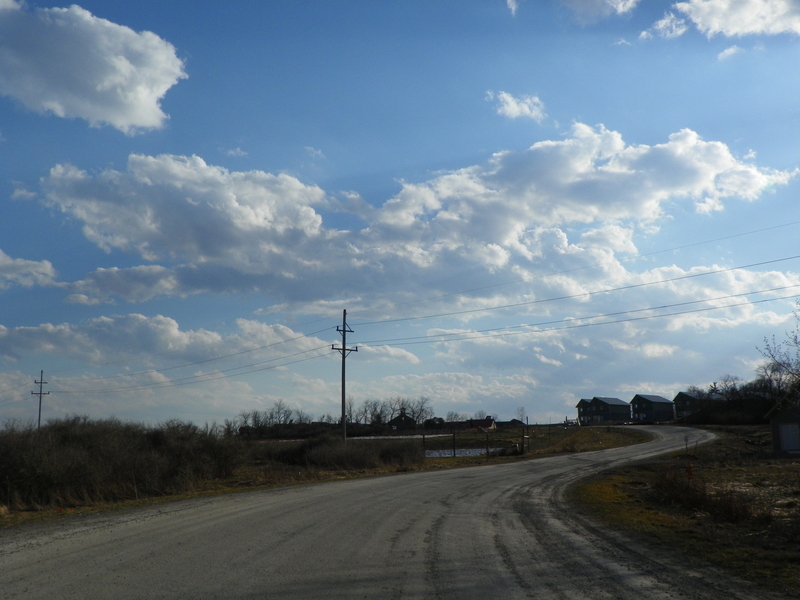 The pre-Ecovillage farmhouse and barn are now a separate property holding an antique shop and the City Lights B&B. 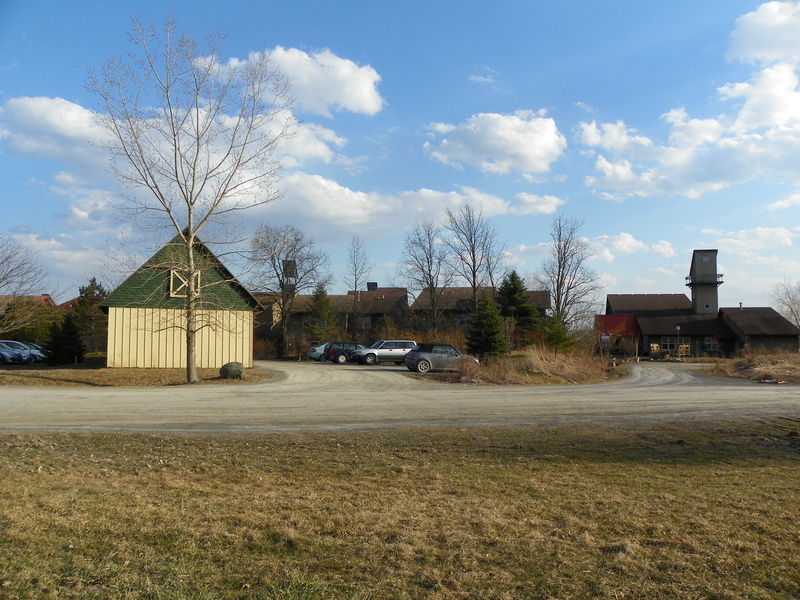 Ecovillage is well underway with its third neighborhood, TREE. 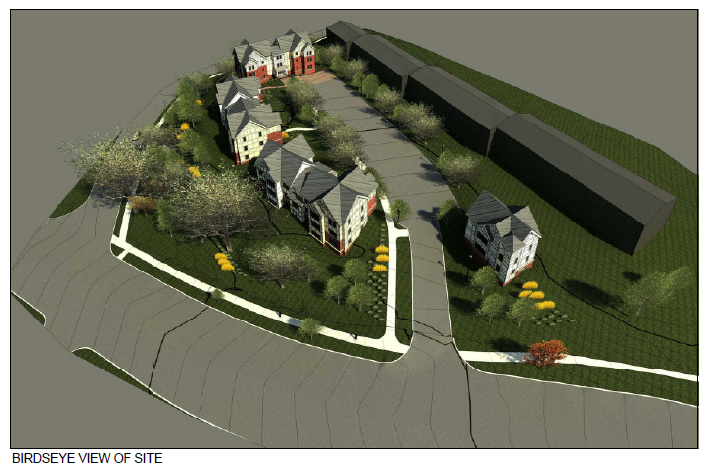 At 40 units, TREE is slightly larger than the first two neighborhoods. Construction is definitely underway, and the majority of the community should be complete before the end of the year. Also worth a quick note, a 900 sq ft “Gourd Workshop” was under construction when I passed through. 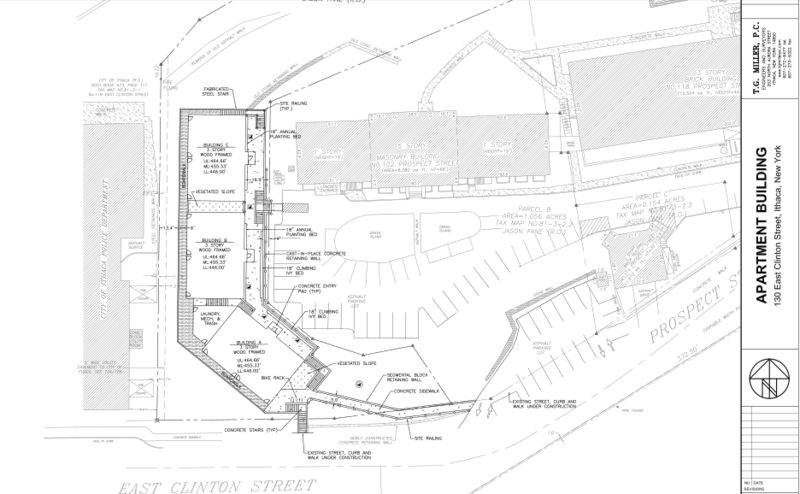 More additions, like an education center and a roadside farm stand, are in the works. If you don’t want to be a creeper like me, Ecovillage opens itself up for a free public tour at 3 PM on the first Saturday of each month. That way, you can avoid being like me, trying to take photos when kids keep wandering in front of them, and having that awkward realization that you look like a child predator. When I first started following Ithaca construction projects (~2006), the only sources for project details came from news sources (which, with rapidly outdated URLs, were shoddy at best), and a thread on the urban development website/forum Skyscraperpage.com. Other than that, some of the local towns would regularly update their online agendas and minutes; most wouldn’t, and attached renderings were unheard of. Over the past several years, things have changed for the better. For one, this blog. 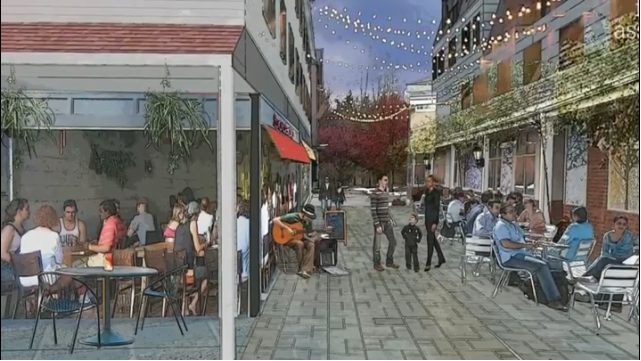 For two, it seems like certain news outlets like the Journal and Times now recognize there’s some worth to keep in track of these projects, especially as growth in Ithaca has accelerated within the past couple of years. I was looking something up recently and stumbled upon a fully-dedicated Ithaca development website, calling itself “Ithaca Builds“. At the time, they had just started putting together their interactive map. Now, the first blurbs are written, and the map has been fleshed out a little more. From my personal standpoint, there was that brief concern of “uh oh, now I have competition.” For one, their HTML skills are way beyond my own, and their maps are much easier to use. For two, the Ithaca side of this blog is really the bread-and-butter these days, as I’ve already covered much of my preferred Cornelliana, and new history write-ups have become fewer. So there’s always the worry that if someone who “does it better” comes along, I’m not going to have the time to keep up, and this blog will fall off the map completely. But the more I thought about it, the more I realized that’s kinda a silly way to look at things. I don’t make any money from this, and given Ithaca’s market size, a “Curbed” style Ithaca site would struggle to be commercially viable. If someone has the personal interest and motivation to do a great website, that’s wonderful. I like to think that in the nearly five years of this blog, that it’s offered quite a compilation of Ithaca-related projects, so even if this fades, I’ve had a good run. In the meanwhile, since their writing has yet to come up to speed, Ithaca Builds and Ithacating in Cornell Heights actually compliment each other quite well. I’ll keep updates coming on my end because that’s how I am. But I’ll be interested to see how their work grows and evolves.